Ok so it turns out eyebrows are exceedingly difficult so far. I tried rooting them and pulled them all out. I ended up painting them and then re-rooting them again and still they look too dark. Back to the drawing board. How about just painting them. I may end up ordering another Celeste or just giving her to my grand-kids if she looks too funky. Can I cry now. After all my work I am thinking of redoing a new Celeste! It wouldn't hurt anyway, now painting the dolls takes me less than a quarter of the time the first one did. I have certain standards myself of what kind of reborn I would put out. The reborn doll would pretty much have to be perfect looking. And she would have to be exceedingly life like. I just think those expectant mommies and daddies out there don't want just a doll. They want a precious little angel to spoil and have fun with. If it looks like a doll, then it's a doll. If it looks lifelike, then it's a reborn. Reborns are meant to look real. Reborns are there for therapy, for snuggling, for spoiling, for changing, for strolling, for role-play, and for collecting. I personally think it's sort of like looking at artwork or like looking at something that would please the eye and give cuddly contentment. I will have to practice on paper over and over as far as painting those tiny little caterpillars. I remember my mother who used to paint flowers on things. She would paint flowers over and over on parchment paper for practice. I would love to look at her beautiful practice flowers all day long. It's gonna pretty much be the same thing. Luckily I have three boxes of parchment paper from all my baking escapades. I am a great painter too but I think I need to get an even finer brush or cut one down to be super fine. I just don't want my doll to look like Groucho Marx. Update: I cut one tiny detail brush down with a hair cutting scissors. I cut a tiny bit of bristles off on two sides and it's pretty fine now which should help. I was able to get fine tiny strokes but practice makes perfect and practice I will. 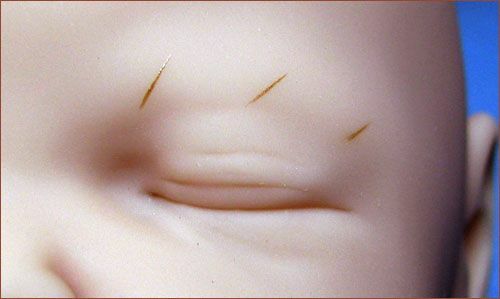 Needless to say I have heard the hooked needle is much better for eyebrows and rooting than the barb or regular rooting needles. I am not sure because I have never done it until now. I don't want my babies looking like corn beef and hash. How will I ever perfect eyebrows without ruining a bunch of dolls. I guess by going very, very slowly. I am trying to keep costs down so should I order the hooked needles. I am going to anyway just because it will help my hair rooting look better. Especially if I get the 42G needle size. I have been using the 36G and it is way too big, makes clunky looking roots when combined with the loop rooting method. Ugh. I don't like the bigger rooting needles but heard one reborner recommending them but wish I had gone with the smaller ones. Those painted eyebrows look best to be honest. 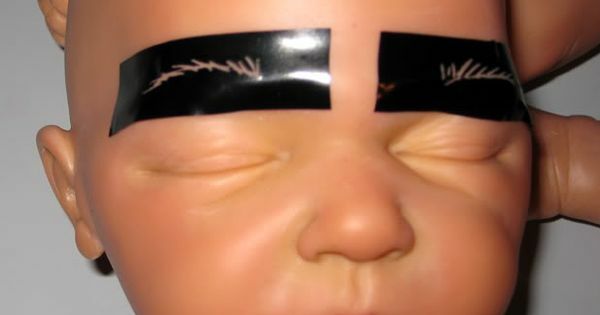 Though I have seen a few dolls where they rooted the eyebrows perfectly. Ummm that must have taken years to perfect. I wonder how many doll heads those doll artists ruined to get there. I am on a quest to find out if I can do better at painting or doing individual hairs with a hook needle which will catch and root one hair at a time. And then there are prisma pencils. Hmmm so many options. Feel free to share your opinions if you want. I tried my very expensive water color pencils and some colors worked and some did not. I am not sure about the pencil idea. I had to just show you guys this picture of someone's method; but maybe it works...I think NOT. I found it on Pinterest...gave me a good laugh though. Those eyebrows are scary looking. I am glad God did not do that with mine. I found this chart online; I think this will be extremely helpful. 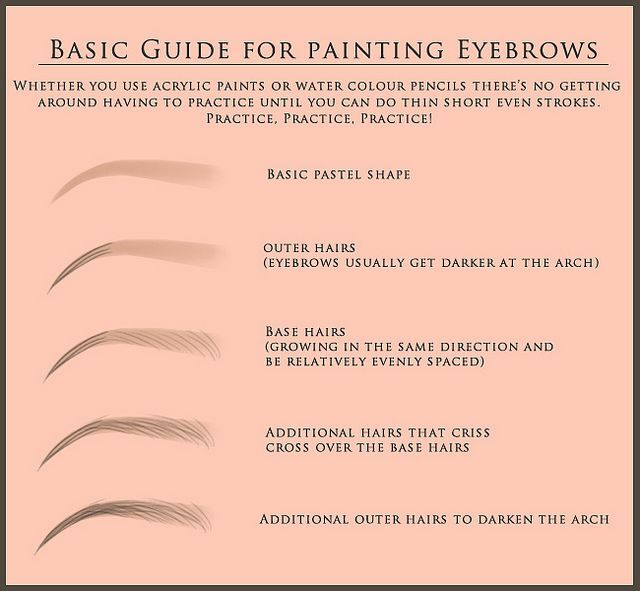 I also found this chart showing different eyebrow shapes; This could also give me help with a variety of different shaped eyebrows. I don't want all my dolls to look identical anyway. There are some who say you can add thinning medium and build up eyebrows before you even paint them. That sounds scary to me. But it would be worth a try on a practice limb if you had one. Of course I don't have one. Also I found this with instructions to paint the main points and then fill in with tiny hairs inbetween: This seems to be tried and true as I have seen a few people do it. 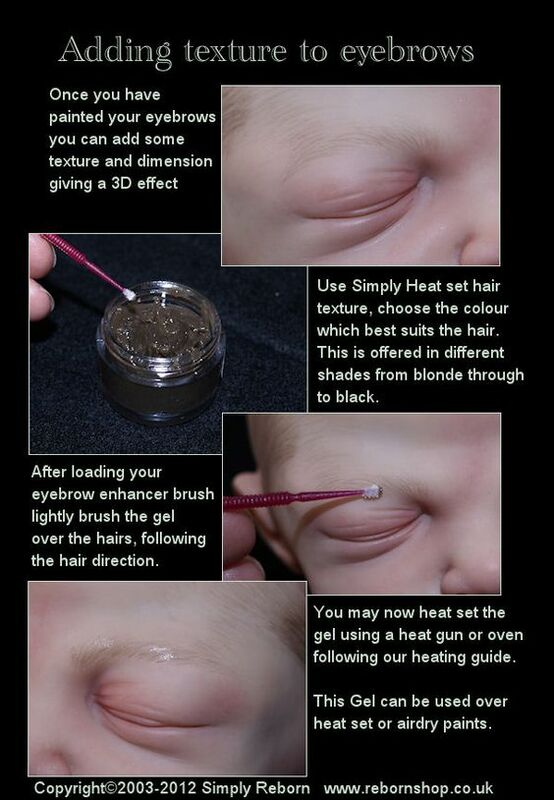 And then Kim at Custom Baby Doll has her own two part tutorial below (part 1). She has a paint and then root combo which looks pretty nice. She is very talented and her paint with rooting over it looks pretty darn nice. She gets that rooting done at just the perfect angle where the eyebrows lay nicely and look realistic. I think this gal Jackie Ortiz has it down for sure in the video below. Her eyebrows are painted so very thin and real looking. I love how hers came out, in my opinion they are exactly what I am looking for. Since a reborn is an artistic creation, I guess it's up to you as the artist. I may stick to painting eyebrows until I perfect rooting them. 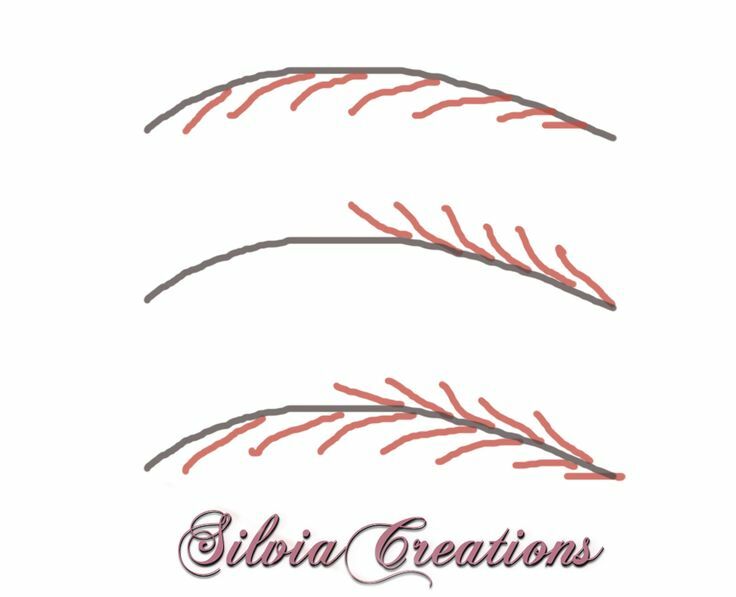 Let me know if you find any better tutorials I would love to try them! I will post any pictures of my efforts in practicing painting.